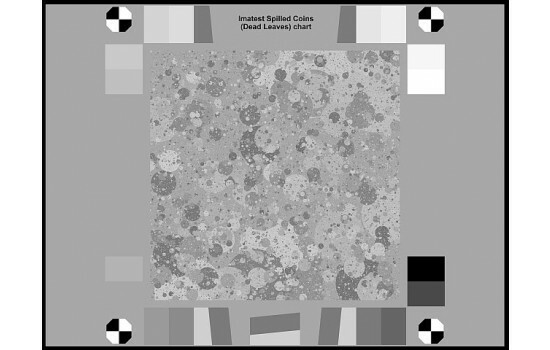 The Imatest Spilled Coins chart is a variant of the Dead Leaves chart designed to measure texture sharpness. 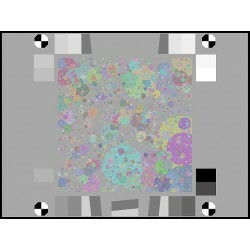 It has several advantages over older Dead Leaves charts, including nearly perfect scale-invariance, which improves the accuracy and robustness of mesurements, and gray regions to the left and right of the chart that facilitate noise removal (using a technique where gray patch noise Power Spectral Density is subtracted from the signal + noise PSD of the central Spilled coins region). Read more about Random/Dead Leaves chart analysis in the Imatest documentaion. 569 mm × 426 mm 22.9" × 17.3"
379 mm × 284 mm 15.43" × 11.7"
284 mm × 213 mm 11.7" × 8.9"